I MADE IT INTO THE PAPER!!!! I received an email from one of the boys' NICU nurses saying that she saw my name in the paper. Enough blah blah blah...here it is! 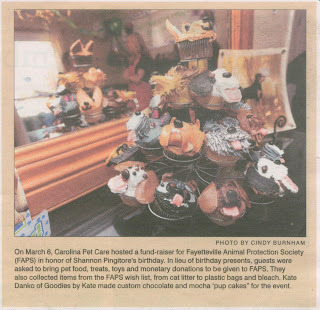 I'm SO excited to have my name in the paper and a picture of the pupcakes I made because they were a lot of work. If you look in the mirror, that's me standing in the background! I put a lot of time into the cake orders I had that weekend, and this article makes it all worth it! KATE! How awesome for you!!! That's so exciting. Congrats!